Blame it on the copy of Sheryl Sandberg’s Lean In on our bedside table, but lately we’re all about finding ways to bring our A-game to the workplace (for proof, see our articles on how to dress for a job interview and what you should never wear to the office). Accordingly, we went to an esteemed group of fashion editors for their sage advice learned from years in the field. Don’t work in fashion or don’t have an office job? Never fear, we think these nuggets of life wisdom apply all around. Click through now for the tips your high school guidance counselor didn’t tell you. 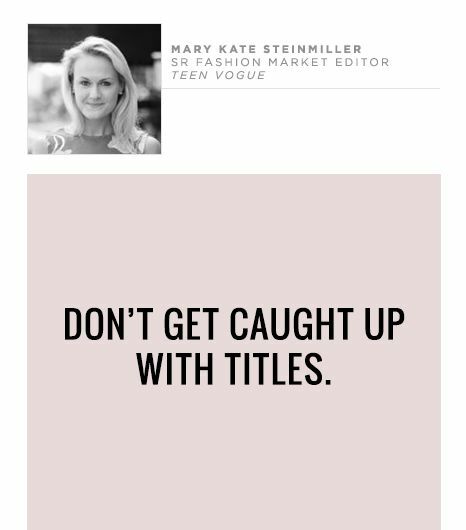 Don’t get caught up with titles. Remember you are an ambassador. Never give up on a task—ever. Be willing to step outside your comfort zone. Think outside your job description.